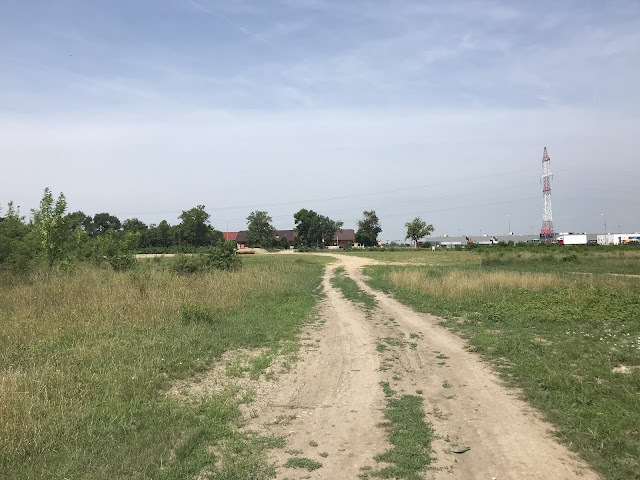 The day started in hot and humid conditions in Nojorid, Romania but within the first mile I had my first positive encounter of the day. I was pleasantly surprised to see “fruit man” from yesterday pass by. He gave me a huge enthusiastic wave and cheer as he drove past. I thought that he was going to climb out of the window such was his enthusiasm. What a great start to the day. I passed Oradea International Airport at mile 2. It seemed strange to see planes when I’m used to seeing farmers fields day in, day out. In fact, I’ve seen this kind of scenery for over a thousand miles now dating back to stage 4 of the run Around The World. Australia had it’s moments and of course the USA route, especially the 1000 mile route 36 from Denver to Indianapolis was almost all through agricultural land. It was on a mass industrial scale in the USA and northern Italy too after the Stelvio Pass. One of the issues that I faced in Australia was that it all looked the same. Mile 10 looked like mile 300 which looked like mile 2000 and so on. You get no real feeling of progress in a situation like that. Of course, the stats tell you otherwise but it’s very easy to let your mind think that no progress is being made and you are stuck with the day in day out mileage for eternity. It’s getting to be a bit like that on this tour. 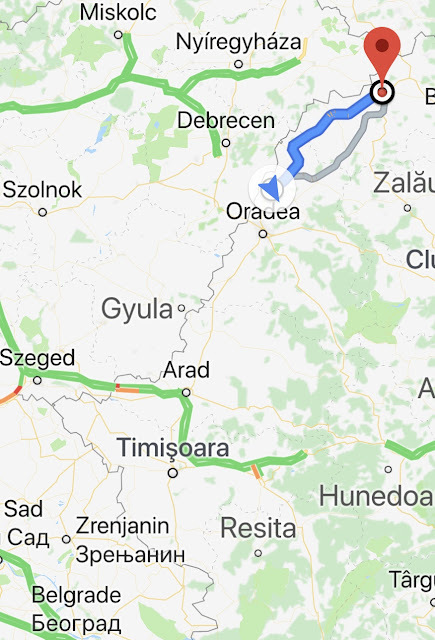 I can spend between 5-10 miles on a road in Romania then travel through a village. Then it’s another 5-10 miles and another village. Repeat that 4 or 5 times a day and that is a typical day for me. 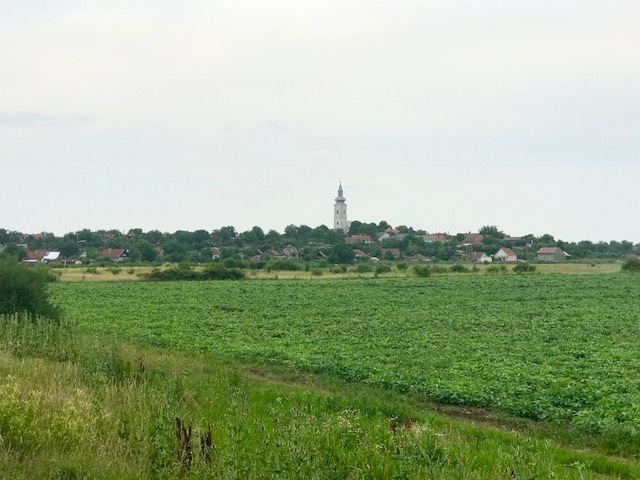 Today was a break from the norm as I had the busy traffic of Oradea to get through. My confidence in busy city centre traffic is very high and I think a lot of that has to do with how well the Romanians drive. I’ve been very impressed. I was stopped at mile 5 by a man outside a shop. He asked me what I was doing. He was a former lorry driver who’d been to the UK with his work. He disappeared into his shop and came back out with a slice of pizza. I thanked “Pizza man” and continued to navigate my way through the busy traffic while scoffing the delicious slice. Facebook follower Craig Fisher commented “It was worth doing this run for the free food alone. The charity fundraising is just a bonus!!”. He might have a point there. I crossed over the river Crişul Repede and onto a quieter section of road. One thing that I’ve noticed on this tour is people’s reaction to the sight of me and Chappie. There are various reactions. Usually, ladies pretend not to notice. Young people are pretty much the same. It’s the male population of 30ish + where you get the questions, the waves and the cheers. At the 7 mile point I stupidly took a short cut which was marked as a walking route. It was all gravel and some steep climbs. I missed a turn, headed back and a local man shouted “Mister! That way is impassible”. My heart sank when I realised I’d have to walk a mile back to the main road. As luck would have it a farm track appeared in the direction I needed to go. I gambled and thankfully it took me back on to the main road. I’d probably wasted no more than a mile. I made it to the 12.5 mile point and called in at a restaurant for some pasta. It took nearly an hour to arrive but I enjoyed the rest and the adjacent garage gave me a 5 litre bottle of water. I’m probably good for water now all the way to Satu Mare. I was stopped by a girl in Satu Nou (totally going against my theory on who stops and talks to me) and she asked where I was going. I told her what my mission was and continued on running. I stopped at a gas station for a coke and a sit down on a plastic chair at the 19 mile point. I was very tired. The owner was very interested in the buggy and I told him of my mission (thus restoring the theory on what demographic of people show most interest). A lady in Rosiori at the 20 mile point (I shall call her night dress lady) shouted from the other side of the road “Water?”. “Yes please” was my reply and she fetched a 2 litre bottle of water from her house. Now I’ve definitely got enough water to get to Satu Mare. I’ve been drinking about 4 litres per day. I made it to Ianca and the same girl (I’ll call her hot pants girl from now on) that I’d seen earlier in the afternoon was at the side of the road. Talk about a feeling of a lack of progression! She cut the small talk this time and propositioned me!! A bit like pants man from 2 days ago, I politely declined her kind offer of, well whatever it was she was offering. The first thing that came out of my mouth was “Sorry, I have a wife”. I might as well have said “Well pet I would, but I have a wife. If I didn’t have a wife it would be fine!”. I think a simple “No thank you” would have been sufficient. She looked around the buggy and said “She not here”. It was then that I muttered nervously “I’m fine but thanks anyway”. That’s the kind of thing you say when someone asks if you want a cuppa or a bag of crisps or something trivial. “I’m fine but thanks anyway”. 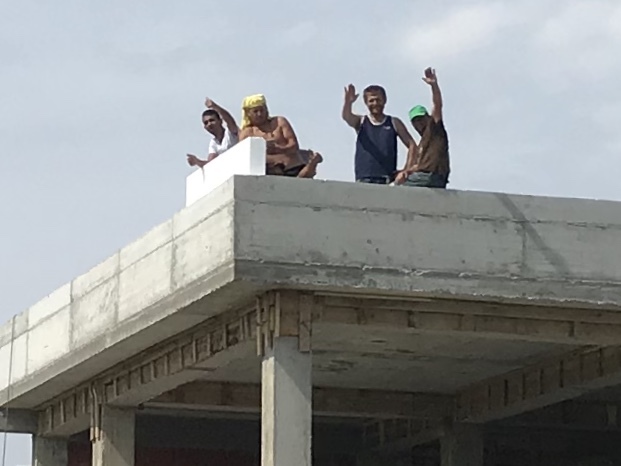 I ventured further into Ianca and tried to ask a family “Caut undeva în siguranță în dormitorul meu. te poți ajuta?”. They couldn’t recommend anywhere safe to sleep unfortunately. I asked a man (Church man) if I could sleep in my Buggy within the church premises where he was working. He was called Alex (that’s the English equivalent name) and spoke good English and agreed. I started to setup camp and Alex said that I could use the shower in the church building that they were renovating. He would also setup a bed in the church hall for me. I’m writing this blog from the bed in the picture above. Having previously thought that my next shower would be in Satu Mare and that I would be weathering another storm tonight, this is like a five star hotel. A huge thank you to Alex for such amazing generosity and trust. A storm is on the way tonight which will last until tomorrow afternoon so having a roof over my head is a huge bonus. Satu Mare is now 65 miles away! I’m bang on target. Now the pressure comes at wanting to reach the B&B on Sunday in time to watch the England match. I think 2 days of 25 miles and 15 on Sunday should do it. The weather will no doubt play it’s part but it would be nice to catch the match. The image below shows the route to Satu Mare and you can see how far from Belgrade that I’ve travelled. Progress is being made.